Pop the popcorn using an air popper or other method. We use this hot air popper. In a small saucepan, combine the oil, syrup, pumpkin puree, cinnamon, and salt. Cook over medium heat for a minute or two, stirring until all the ingredients are combined. Measure two cups of plain popcorn and set aside. Put the remaining popcorn in a roasting pan. Pour the pumpkin mixture over the popcorn and stir until evenly covered. Bake for 6 to 8 minutes, stirring every few minutes. Let the popcorn mixture cool. The glazed pieces of popcorn will harden as they cool. 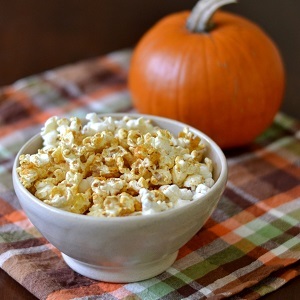 Stir the plain popcorn into the pumpkin-glazed popcorn mixture and serve. This recipe yields about 8 cups, and the total cost is $.85 or $.21 per serving (and that’s using organic popcorn kernels). Perfect after school treat anytime of the year.